Lightly season the venison then heat a frying pan over a medium heat and add a little sunflower oil. Place the venison loin in the pan. 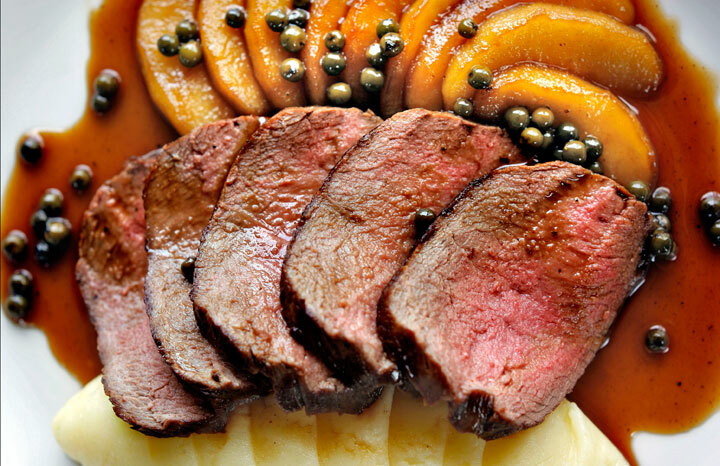 Using tongs to turn, sauté the loin of venison until it forms a caramelised crust all over. Reduce the heat slightly and add the 20g of butter and roll the meat in the butter and oil mixture. Let the meat cook to medium rare (the venison will be dry and tough if overcooked) taking care not to burn the pan. When cooked, remove it from the pan and set onto a warm plate to rest and let the juices redistribute through the meat. Tip the fat from the pan then return it to a medium heat and add the 30g of butter followed by the apples. Toss the apples in the pan until they colour slightly then add the sugar. Cook to a light golden caramel then add the wine, which should stop the caramel going too far. Boil the pan vigorously to form a sauce, stirring in the chicken and beef stock and peppercorns as the wine has almost evaporated. Finish with 2 or 3 drops of red wine vinegar and set aside. The danger is making jam in the pan and having the sauce set on the plate. To serve, add any juices that have run from the meat to the sauce then put the venison into a hot oven for 3 minutes to warm through. Don’t overheat the meat or all the good work done in resting the venison will be undone. Slice into 6mm slices and serve with the glazed apples alongside the meat and the sauce around, with potato mash on the side. Recipe devised for Yours by Nick Nairn, an ambassador chef for the 2014 Food & Drink campaign with www.eat-scottish.co.uk.